A very special presentation took place at Ryde Masonic Hall on the 3rd of May. Representatives from many Island Charities along with the Lord Lieutenant of the Island and other important local dignitaries, attended a presentation hosted by the Provincial Grand Master, RW Brother Michael Wilks and Island Brethren. The purpose of the evening was to present cheques to the various charities, all monies having been raised by the 17 Island Lodges. 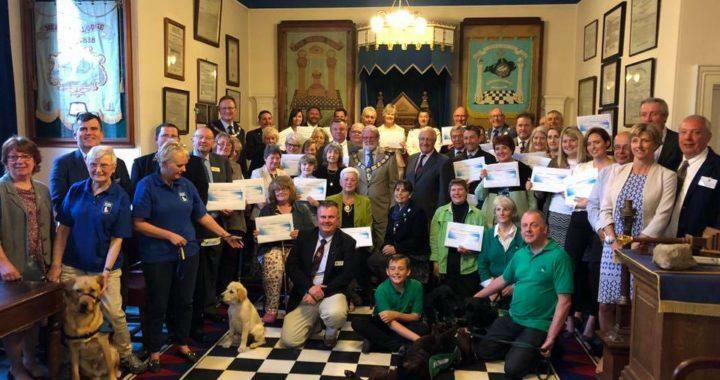 In all, 31 charities attended and the total amount of money presented was an impressive £72,500.00, which was well received by the various representatives. Each of the representatives had the chance to speak about their various organisations and it was very clear they all work very hard for their causes. All were very grateful for the support Island Lodges were giving them. After the presentations, the Provincial Grand Master addressed all those present and invited the representatives and dignitaries to view the Lodge room where a group photo was taken. This was followed by a superb buffet in the dining room. An evening like this does not just happen on its own, so many thanks to W.Bro. Pete Edwards, W.Bro. Tim Lewis and their team, including the Lodge Charity Stewards for arranging the first such evening on The South Island.